Hopefully this will change in the next coming months – but I make no promises. 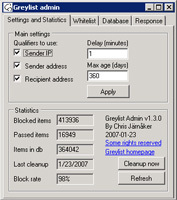 In September 2007 I published an little application of mine called Greylist. At that stage Greylist was a bit unpolished and rough but it did evolve during the next coming months whenever I could stick a bit of time into it. Today I published v1.3 which now is more of a grownup and handles both stress and problems in a more correct way. Some interesting statistics about the artice: Over 8500 people has read the article in the last three months and it has been downloaded over 1500 since end November. Features of today includes selective blocking (sender ip and/or sender address and/or recipient address), stores data in a access db or in MS SQL, the database can be shared across the enterprise, automatic pruning. In the latest version I added functionality for different actions upon grey listing a recipient as well as custom server messages. And in many scenarios it block up to 98% of all spam!! – Grey listing temporarily blocks an email in an attempt to filter out spam servers. – Greylist (the program I wrote) only runs on Exchange 2000 and 2003.